They are a traditional local butchers, who only buy best quality produce for wholesale, and treat retail customers with a selection of everyday delicacies at their own shops. John Crawshaw’s bright logo should draw any true foodie in – that’s where you’ll find expertise and excellence. We arrive at Crawshaw’s headquarters in Stocksbridge in the early hours, instantly realising it’s their busiest time of the day. There are crates of meat being delivered every five minutes; those already packed they are taking away to reach over 200 shops, schools and other businesses on time. What was once a humble family butchers, is now a bustling establishment. But, the approach to the customer is still as personal and attentive as it was decades ago. 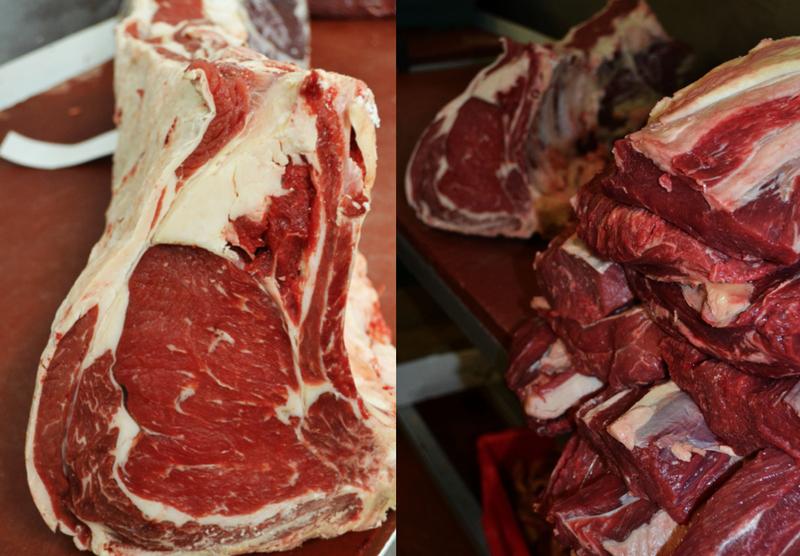 John Crawshaw deliver their award-winning beef, lamb, pork and poultry throughout Sheffield and South Yorkshire, as well as produce pork pies, sausages and recently also ready meals for retail customers. “Working couples don’t have the time to cook a 5h roast dinner, so we provide a solution,” explains Dan. On top of an efficient customer service and great understanding of people’s needs, John Crawshaw are primarily committed to selling fresh, finest quality meat. “70% of what we buy is sourced locally, which is what the Seven Hills brand promotes,” says Dean Heathcote, another one of Crawshaw’s longtime and trusted butchers. “The Seven Hills mark ensures the beef and lamb were reared within 30 miles of our butchers, and that’s what most businesses demand these days” he adds. As it’s been proven to us many times, restaurant customers relate to locality. It’s not the cheapest it can be, but you can trace our meat all the way to the farmers that sells it to Crawshaw – and since our steaks are in Sheffield’s top 5, it’s surely worth the extra penny for less food miles and better quality overall. 1. Marinate the steaks in red wine and veg for at least an hour, up to 12 hours. 2. Pat the steaks dry and retain the liquor. 3. Heat some oil in a pan and colour the steaks on both sides. Place in a large tray. 4. De glace the pan with some of the red wine and pour over the steaks. Pour in the remaining liquor along with the balsamic and redcurrant jelly. 5. Cover with brown stock, cover the tray with foil and cook on 150 °C for 1,5 -2 hours or until bone would come out clean. 6. When ready, carefully remove the steaks from the tray, making sure not to break up the meat so they keep their shape. Cool. 7. Pass the liquid and reduce to a thick glaze, adding more redcurrant jelly if needed. 8. Serve with a choice of side – here with creamy mash and pigs in blankets.